When I was in 10th grade I loved (from afar) a boy in 11th grade who worked for the movie theater. One night I went with a group of friends to see Aladdin. When I approached this handsome, red-headed older man to pay for my ticket, he waved me through and smiled at me. He knew who I was? He let me into the movie for free? I almost fainted. The theater was packed. Almost every single seat was taken and I had to sit separately from my group. I found two seats on the aisle near the front. I left the aisle seat open and dreamed up this great fantasy in which my true love came into the theater and sat by me. Like a date. I dreamed and wished and hoped and prayed it. I could feel his invisible presence in my imagination and it was as if he were really there. Sitting by me. Like a date. Have you ever wished for something so hard that it came true? He and I never spoke. Not that night and not ever again. 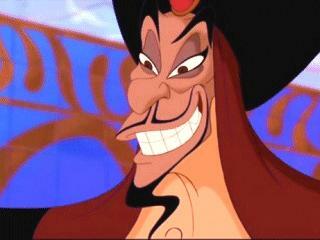 To this day, I can't see an image of Jafar without remembering that moment, the most romantic of my entire life.